Grand piano sounds from this smaller-sized keyboard. 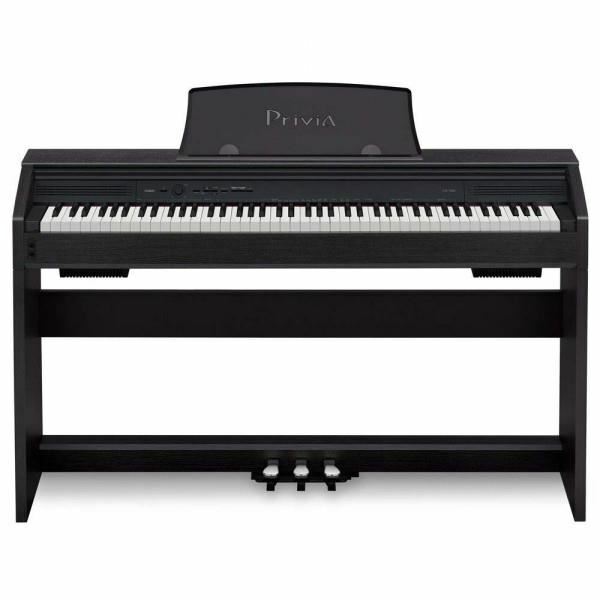 The PX-750 is a stylish digital piano from Casio’s Privia line that has a look as classy as its sound. The PX-750 has the grand piano sounds that you’re looking for, plus 18 tones with split and layer, so you can get that big piano feel in a much smaller space. This 88-key digital piano also features a 2-track recorder, dual 8w speakers, USB MIDI and 3 pedals for realistic piano style playing. The keyboard is housed in a sturdy black cabinet with sliding keyboard to help protect your investment. The award winning grand piano sound in Privia has been dramatically improved. 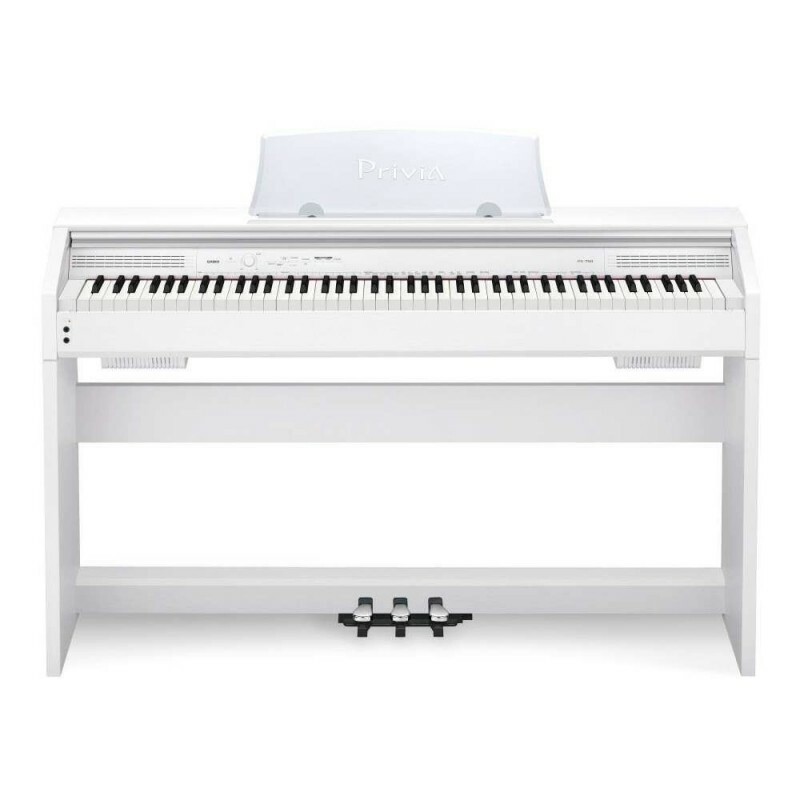 The PX-750 utilizes more than three times the memory of the previous generation for a more natural piano tone. In addition, Casio's proprietary sound source "AiR" (Acoustic and intelligent Resonator) provides unmatched realism and detail. This engine provides seamless dynamics for a remarkably expressive and powerful performance. For further realism a new Damper Resonance and Hammer Response simulator provides the rich sound of the strings when the sustain pedal is used. The PX-750 also features a new redesigned 88 note Tri-sensor scaled hammer action keyboard. This action features simulated Ebony and Ivory textured keys for an incredible feel and it's three sensors capture the dynamics of a performance with unparalleled speed and accuracy. To further enhance the experience, the action and the sound engine take into consideration the speed at which different sized hammers move inside acoustic grand relative to velocity the keys are pressed, this timing nuance provides the ultimate key to sound experienc. In additional to grand piano sounds, the PX-750 has many other instrument tones including strings, organs, electric pianos and bass. The PX-750 provides split and layer capability allowing you to play bass in your left hand and have two layered tones in your right. Duet mode splits the keyboard into two equal ranges, allowing student and teacher to use the piano simultaneously. A two track recorder can even record and playback your practice and performances. The matching keyboard cover, stand and pedal board make this a complete digital piano that is a welcome addition to any home dècor.